In Part I of Why Bezels Matter to Rolex, we examined the utility of the rotating bezel in the Rolex Turn-O-Graph and Submariner and how the design philosophy and intent of the watch centers upon the functionality of the bezel. In Part II, we continue on to the GMTs and Explorer II. The design of the GMT Master and GMT Master II bezels are very similar to the Submariner, but differ in that they rotate in two directions rather than in only one direction and the bezel insert is entirely flat with no raised marker at the 12:00 o’clock position. 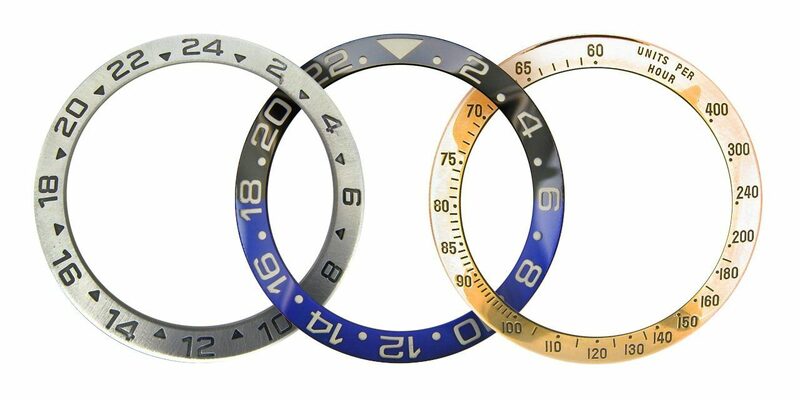 Used in conjunction with the watch’s 24 hour hand, the bezel indicates either a second timezone, or a third timezone depending if the watch’s 12 hour hand independently rotates. The original GMT Master did not have an independently rotating 12 hour hand, but that changed in the mid-1980’s such that the 12 hour hand can be independently set from the 24 hour hand, thus giving the ability for the GMT to track three time zones. The bezels of both the Daytona and the Explorer II are fixed and do not rotate at all. Despite being fixed, the bezel provides functionality and utility to the watch. The bezel on Daytona is either solid steel, gold or Cerachrom ceramic depending upon the model and is etched with a tachymeter such that one can determine the speed of race car or any other moving object over a predetermined distance, whether expressed in MPH or KPH. The Explorer II bezel looks very much like the GMT bezel with 24 hour designations, but unlike the GMT, the bezel does not rotate and thus does not track a third timezone. The intent behind the Explorer II was for legible 24-hour time reading with its large indented numbers recessed into a stainless steel ring such that the numbers could be felt as well as read. Unlike the GMT, the hours between 7 and 17 are flipped upright such that they can easily be read without rotating the watch. In Part III of Why Bezels Matter to Rolex, we will examine the YachtMaster bezels and the new Command Ring bezels found on the Yachtmaster II and the SkyDweller.